The Sobralia orchid genus grows ubiquitously in much of South and Central America; I've even heard them called "ditchweed"! They have beautiful flowers whose appearance is somewhat similar to a large Cattleya orchid. Flowers can be more than 6 inches (15cm) across in some species. There are many colors: the genus includes pink orchids, white orchids, yellaw orchids, red orchids, purple orchids, green orchids, and others. The flowers are very short-lived: they individiually last a day or less, and appear sequentially on the inflorescence. The plants have thin, veined leaves arranged all along the stem, which varies in length from 1 to 20 feet (.3-6m) depending on species. 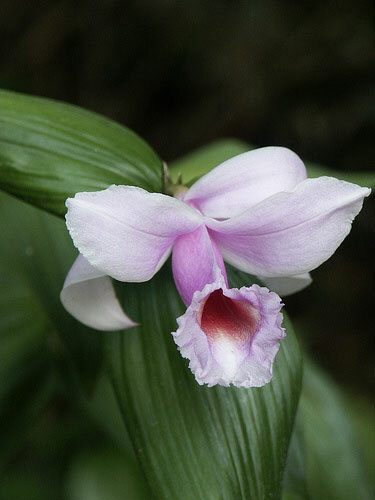 Most species grow as terrestrial orchids, though they occasionally appear as epiphytes. At this time, the taxonomy of the genus is unclear and undergoing revision, but there are well over 100 species. They like bright light; I suggest 3000-5000 footcandles, similar to Cattleya lighting. You may be able to gradually adapt them to more light, perhaps even direct sun. Provide intermediate to warm temperatures, 70-85°F during the day with a 10-15° (6-8C) drop at night. Some seasonal variation is acceptable. In places where winters don't freeze, you may be able to grow them outdoors year-round, and perhaps incorporate them into a flower garden. They like to remain somewhat evenly moist; water before the potting mix becomes dry. In nature, they often grow on somewhat mountainous hillsides that constantly have small amounts of water dripping downhill. Overwatering is possible, though, so don't keep them too wet, especially when the plant isn't actively growing. Provide 50-70% humidity. Choose a fine potting mix, such as fine fir bark or coconut husk pieces, or pot them in sphagnum moss. You want something breathable but that doesn't dry too quickly. It should be fine enough to keep terrestrial orchids' roots happy. The best time to repot is after it finishes flowering. Dividing these orchids is a good way to propagate them, but they like to remain in a large clump; I wouldn't split them into pieces smaller than half a dozen to a dozen growths.